Look at the drawing. 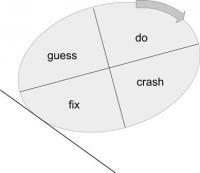 This is a typical depiction of the Deming Cycle. As the wheel rolls, what order do the quadrants touch the ground (or pass any point in your vision)? Yup, opposite to the arrow. I'd like to say I spotted this but I didn't. (I can't give credit as she asked me not to). In fact the Wright Cycle diagram in my Introduction to Real ITSM has the same problem. (The Wright Cycle is named for the Wright brothers who crashed a few planes in their time before they got one in the air). Submitted by skeptic on Tue, 2009-06-02 21:47. Submitted by jvbon on Tue, 2009-06-02 22:44.
this is the image I showed you in a previous comment..... scroll up or click http://www.itskeptic.org/deming-cycle-diagram-wrong-way-round#comment-3803. It's now part of a Microsoft MOF Companion Paper, and of course that makes it much more acceptable compared to my previous posting. Isn't is terrible that one has to write a MOF companion paper to get a graphic noticed :-( ? Submitted by skeptic on Tue, 2009-06-02 23:37. Submitted by Richarddk on Wed, 2009-06-03 10:14. To end the squabbling I took the initiative to recreate the diagram to please everyone. Does this make me a Deming expert perhaps? Submitted by Bus67 (not verified) on Fri, 2011-05-06 04:41. Why is it the perimeter of the circle that is on the line? Surely it should be the center, then it doesn't matter which direction the cycle rotates - as long as it is exercised. For that mattter the line should also be stepped as quality outcome improvement occurs in the act phase. The line is only smoth when there are hundreds of iterations. Maybe the graphic designer has avaeraged the improvement over time. Ewww - I feel dirty using the term "average" in a quality discussion. But lets not forget that the diagram conveys adequate meaning as is. Afterall we are generally dealing with 'business folk' when we use it. They seem to get it, based on the existing diagram. What does that say about those 'buseness folk' eh? Oh, but what does it say about us 'IT folk'! Hmmm. I must admit I do love the use of the words "Direction of rotation" to help us understand that the arrow showing the direction of rotation means that it indicates the direction of rotation! Submitted by bobgrins on Mon, 2009-04-27 14:44. I just always assumed the Starting Point was shown at the top of the wheel, because that's where most people will start reading. Since the wheel's motion was continuous (you don't do just one revolution and then quit (okay, we probably do, but we shouldn't)), it didn't matter what point was hitting the ground in the drawing; it was implied that you start with Plan and then kept rolling through the steps over and over. It's a static image of a moving thing. Plus, the "fix" looks backwards and goes against the intuitive eye flow. Submitted by skeptic on Mon, 2009-04-27 20:30. Submitted by rpmason (not verified) on Mon, 2008-12-08 18:03. I always assumed that the arrows rotate, not the wheel. If the wheel rotated, you'd be rolling uphill. Maybe the slant represents friction - to ensure that you don't go through the cycles too fast? Submitted by jvbon on Mon, 2008-12-08 21:29. People that had a problem with the wheel going to the right always perceived it as a wheel going uphill - up the slope of quality - and they 'read' the sections of the wheel touching on that slope. The axes clearly show that this was the intention of the graphic. For that kind of graphic, with ascending slopes of quality, the wheel should turn left-up: this solves the entire discussion. But maybe we should simply go back to the original, where Deming made this very simple: just keep the PDCA wheel turning and quality improvement will follow. Submitted by JamesFinister on Tue, 2008-12-09 07:10. A long time ago I came across a spiral, or probably more correctly, helical, model as an alternative which avoids any ambiguity as to how going through the cycle translates into progress towards improved quality. Submitted by ianclayton on Tue, 2008-12-09 22:10. Jan's point is well taken - so back to what the diagram is trying to convey. Find a problem or opportunity for improvement, address it, realize and bank teh benefit, and stabilize matters before finding and addressing another. Just a thought - so why does it start with Plan? In real lief it does not. Check: what is the purpose of the system, what does the customer want, how is it working, is anything wrong, what is the impact? Plan: what needs to be changed to improve matters, what actions are needed, against what measures....? Regardless, we should all take note that bland replay of a concept is suspect. Check the source, check the real meaning and purpose, and be prepared to make it work with your own interpretation rather than parrot style use. Submitted by jvbon on Wed, 2008-12-10 07:25. Submitted by JamesFinister on Tue, 2008-12-09 22:17. The basic question of check in the terms you put it came up in a commercial discussion today. Why do we have a target for x? Needless to say doing some digging revealed that what both parties were attempting to measure was not value adding. Submitted by jvbon on Mon, 2008-12-08 18:01. Sorry guys - this was already solved last year when we were getting a bit tired of all critics that said the same about the graphic we've had for a decade in the ITIL Foundations book. Whatever we did, change the order of PDCA to PACD, add arrows or numbers, there always were people who didn't like the solution. So we sat down and asked ourselves how to get rid of this little bugger. 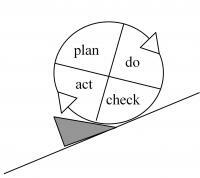 It was Wim Hoving who came up with the brilliant idea to mirror the whole thing: we would still read PDCA clockwise, and the cycle would finally touch the slope of improvement in the right order: PDCA! All kudus to Wim. Brilliant. A great example of out-of-the-box thinking. I uploaded the graphic for you at ITSM PORTAL (still alive), see http://en.itsmportal.net/en/node/16014. I hope that there will be some critics that will again not like this - so we can go on tracking down the ultimate solution: I always like the challenge. But for now, I'll settle for this one. Had no complaints yet! By the way: as far as I know, Deming never drew a slope below his graphics, so all of this was our own fault! But also: there is no 'official' graphic, so this version is as valid as any other. Submitted by deaf-llama on Fri, 2008-12-12 20:13. However, I'm sorry to have to inform you that the Dutch creativity you show from 2007 was prempted by work conducted in 1975... I have attached a link to a scanned document taken at the time that is somewhat granular, I'm afraid. Submitted by jvbon on Mon, 2009-02-02 13:26. Great! As always, success has many fathers. But this time I cannot ignore the fact that they've beaten us to it! Which was not a competition by the way... We just wanted to solve a problem we found in our mailbox far too often. Submitted by Visitor (not verified) on Mon, 2008-12-08 15:34. I have just realized that the wrong diagram is everywhere: The ITIL books, the websites, even my own presentations, my class books... and nobody ever mentioned that would be possibly wrong! No wonder your friend prefers not to mention her name... Her life could be in danger! Submitted by deaf-llama on Mon, 2008-12-08 10:34. Reverse the slope and it works! I'd love to know who drew the original slope diagram. I've seen many animated PowerPoint versions with rotating wheels moving up slopes wrongly and still nobody seemed to comment that it's back to front. Reverse the slope - high on left , low on right and it works. Maybe only right to left language cultures (e.g Arabic)would by choice do it that way? Deming never drew the slope as far as I know. Submitted by kengon on Mon, 2008-12-08 20:46. I agree with you... I would too! The interesting thing about it would be to discover what the original creators intention was (what they were trying to communicate) and then compare that to how its been (ab)used by others. Submitted by v36 (not verified) on Mon, 2008-12-08 11:28. The brothers Wright analogy has been around since the very first Nato Conference on Software Engineering in the 60's. It was Jerry Weinberg who has set this right in Rethinking Systems Analysis and Design (1988). The systematic approach in learning how to fly was unprecedented: starting with gliders, inventing aerodynamics and windtunnels, controlled experiments.